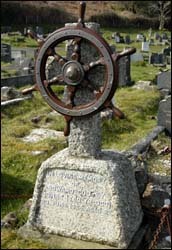 As you might have guessed from the ship’s wheel on his gravestone, Edward Goodey Jones spent his life on and near the sea. He was something of a Llandudno celebrity, known locally as Ted yr Ogof (shortened to Ted yr Ogo on his gravestone). Ogof is Welsh for cave. Ted’s family were known as the Ogof family because his grandparents had lived for 37 years in a cave near Llandudno – raising 15 children there. Ted and his six brothers all served in the armed forces in the First or Second World Wars. One was killed in 1915, another in 1940. 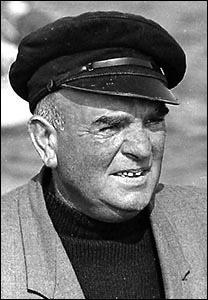 Ted earned his living from fishing and taking tourists in his boat to view the Great Orme from the sea. When he wasn’t selling fish from his handcart in town, he could often be seen mending fishing nets on the prom. The portrait on the left was taken by John Lawson-Reay. A memorial to him was erected on the prom near the spot where he died, aged 52, in June 1965, possibly of a heart attack. You can see more information and pictures of him on our page about the memorial.